More than 100 dolphins have now beached off Cape Cod, Massachusetts, as mammals continue to get inexplicably stranded on the region’s beaches. Three of them died on Friday, meaning that of 116 common dolphins that have beached since January 12, 84 have died, though rescuers have managed to save the rest. Scientists have theories, ranging from geography, weather changes or behavior of their prey. Mike Booth of the International Fund for Animal Welfare, which is leading rescue efforts, said dolphins remain close off the Cape Cod and more strandings are possible. Massachusetts lawmakers held a Congressional briefing on the issue Friday and campaigned for federal funding to hep the staff and some 300 trained volunteers, the Cape Cod Times reported. 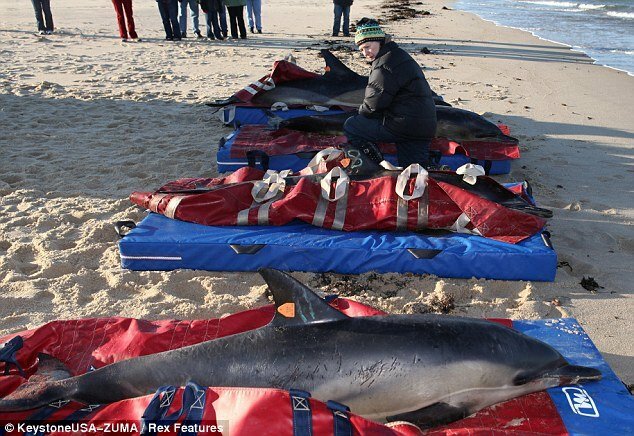 Friday’s death came after ten dolphins approached Wellfleet, and four beached. Three died and one was rescued. Although this time of year is known to be “high season” for dolphin stranding near Cape Cod, IFAW aren’t sure why so many dolphins are beaching now. One theory is that the marine creates get stranded during low tides while hunting for food. When the tide goes out, the dolphins become stranded. Katie Moore, a Cape Cod dolphin rescue veteran of 15 years, told CNN that this is only the second time she has seen this many dolphins washing ashore. “Sometimes they come up one at a time, other times we see them 10 at a time,” Katie Moore said.